The Jive Engage platform is the most comprehensive and innovative Social Business Software on the market. It brings together the most powerful features of social networking, collaboration tools and community software to deliver the richest user experience for every type of Social Business network. In this video you’ll see a demo of Goshido then a demo of Goshido running inside of Jive. Jive helps people engage with colleagues, customers, and the social web. Goshido is to action what Jive is to engagement. Jive helps people engage and share. Goshido helps people focus and take action. With Goshido project management for Jive you can start to coordinate your activities and projects right from your Jive dashboard. Tasks and actions rarely stand alone, and they’re almost always part of something much bigger. Boost Productivity: Goshido keeps track of everything you need to do. And when your tasks involve others or are part of a larger project, you know who’s involved, who needs to do what, and when it needs to happen. Action Focus: Goshido helps you focus on the communication and tasks that matter, understand potential project risks while you can still address them, and review lower-priority communications when you have time. Accountability & Access Control: Goshido provides fine-grain access controls on project work, allowing you to coordinate activities inside and outside your enterprise. 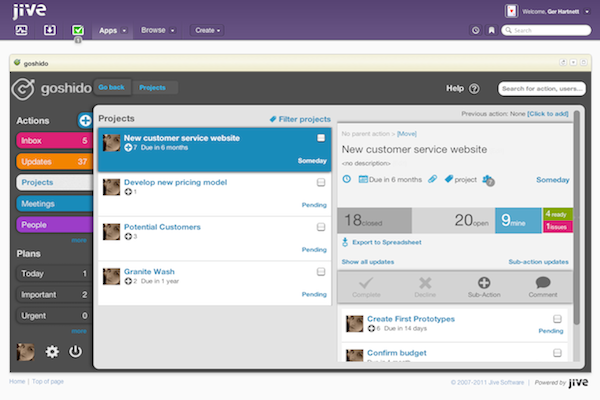 Goshido is the Perfect Blend: agile projects, simple workflows, & team productivity. 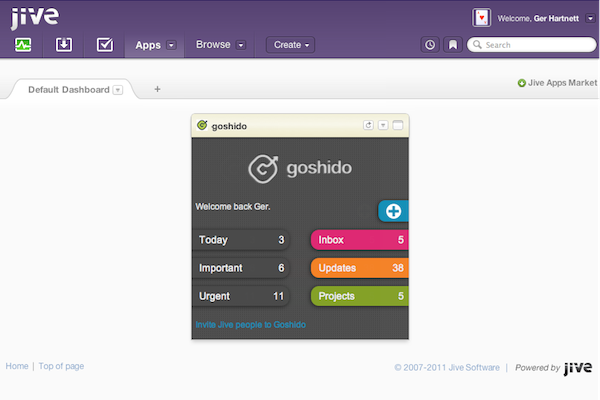 The Goshido Jive app shows your personal dashboard for Goshido. From here you can go straight to your inbox, updates, projects or today plan. 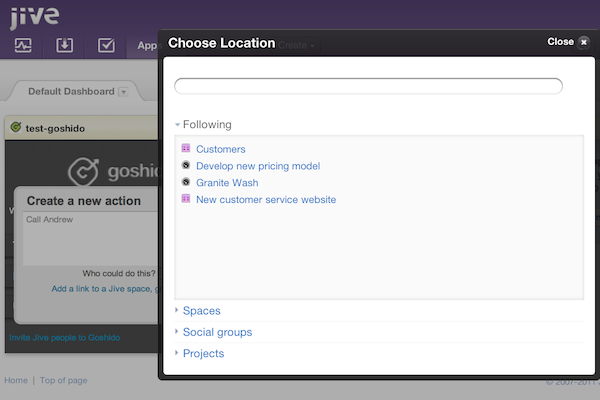 You can create actions in Goshido from within the Jive app. These can be associated with a Jive space, group or project. If associated, a discussion with a link to the Goshido action is started in the Jive space, group or project. We create two way links between Goshido and Jive. 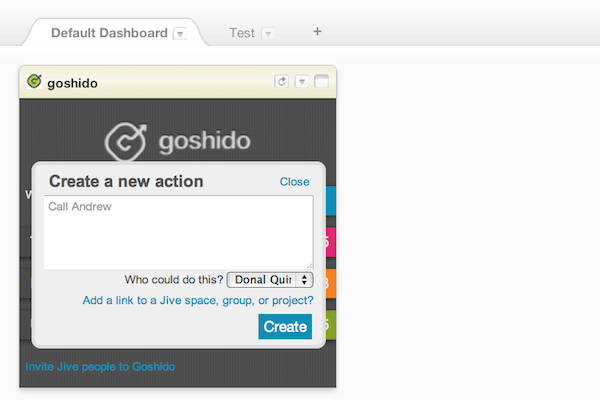 Users in the Jive space, group or project will see the new Goshido action in their Jive activity stream. Users in Goshido will see a link to the Jive space, group or project. You can invite Jive users to Goshido. This will setup an account for the person you invite in Goshido and send an action notification in Jive which will allow them to install the Goshido Jive app.